The UCI is recommending a 2-year-ban for 2006 Giro d'Italia winner Ivan Basso, who admitted last month he saved blood for later doping, but stopped short of saying he had used the refrigerated blood. The UCI made the recommendation in a letter to Italian cycling federation president Renato Di Rocco. The federation meets tomorrow to decide on disciplinary action against the former CSC and Discovery Channel rider. Should the Italian federation give Basso the lesser penalty (which would allow him to start the 2009 Giro d'Italia), the UCI's anti-doping chief promised to appeal the ruling to the Court of Arbitration for Sport. CyclingNews.com | Basso: "It was only attempted doping"
Ivan Basso spoke to reporters today about his hearing with an Italian anti-doping official yesterday. He admitted that bags of blood found in the refrigerator of Dr. Eufemiano Fuentes and labeled “Birillo” were his, but he said he had never used a single bag to boost his performance, or used any other illegal substance or process. It will be interesting to see whether any of the documentation found in Madrid suggests any more: There were reports last year of pages that appeared to be riders' doping schedule, and other reports of billing information for the doctor's services. La Gazzetta dello Sport (in Italian) | Basso: "È tentato doping. Mai usati prodotti illeciti"
La Gazzetta also has video from the press conference. Ivan Basso came clean today. At a hearing with an Italian anti-doping prosecutor, the defending Giro d'Italia champion admitted his involvement in blood doping. Basso, 29, told Ettore Torri of the Italian Olympic Committee (CONI) he was in fact involved with Spanish Dr. Eufemiano Fuentes, and said he would cooperate with the ongoing CONI investigations. Facing a likely DNA test to confirm or deny his involvement with the doping ring, Basso looks likely to be suspended from all racing for 2 years, and from ProTour teams for an additional 2 years. The head of the Italian cycling federation Renato Di Rocco applauded Basso's decision to collaborate, telling the Gazzetta dello Sport, "Ivan has done exactly what everyone asked of Pantani, and Marco didn't do; now, we ask in the name of cycling to not leave Ivan Basso alone." "Most of all I am very sad that a talented rider like Basso seems to have been involved in some illicit practices," he said. "On the other hand I'm trying to look at this news in a more positive light. Our constant efforts, with our other cycling partners, to put cyclists under pressure are paying off. "Right now it's not easy to break the rules," he added. Basso is expected to hold a press conference tomorrow to make a public statement. Gazzetta dello Sport (in Italian) | Basso confessa: "Tolto un peso dalla coscienza"
originally uploaded by Sergio Maistrello. 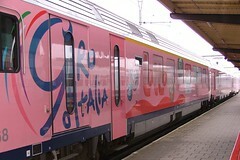 I had hoped this year's Giro would be heavily posted on Flickr, but so far, it's been pretty disappointing. Finally, today, Sergio Maistrello posted 18 photos from the start in Pordenone. There are a few from yesterday's stage, too -- I'm partial to this shot (which two minutes later got a few more cameras), and AllessioAllessio's set from Livorno. Also, this one shot by Giovanni Lentini. Here's a composite from the prologue that's a nice idea, and a great panning shot of Bobby Julich (at right) in the ITT. So is there any other shared gold out there on the other photo sharing sites? Feel free to link good Giro photography in the comments. Here are Flickr collections for Giro d'Italia and Giro. New pink jersey leading T-Mobile, old pink jersey w/Gerolsteiner squad. Stefan Schumacher took an enormous win in Belgium today, winning Stage 3 of the Giro on the ascent to the citadel of Namur. Schumacher wisely marked QuickStep's Paolo Bettini, who dropped the field to try to reel in Discovery Channel's Jose-Luis Rubiera, but couldn't close the gap. At about 800 meters to ride, Schumacher squashed the Cricket, kung-fued Chechu, and took the biggest win of his career. Chechu was 2 seconds back for 2nd, and Schumacher's Gerolsteiner teammate Davide Rebellin led in the field 6 seconds back. Factoring in his margin of victory over Paolo Savoldelli, and the 20-second stage win bonus, Schumacher finds himself in the race leader's jersey, 13 seconds ahead of Savoldelli, 23 seconds ahead of Davide Rebellin. Despite losing the race lead, Paolo Savoldelli gained time on most of his overall GC rivals, and now leads Sergei Honchar by 18 seconds, Danilo Di Luca by :23, Ivan Basso by :28, Damiano Cunego by :30, and Gilberto Simoni by :49. Team Milram sprint superstar Alessandro Petacchi got tangled up in a late race pileup, needed medical attention, and came in 14:38 back. After the race, he abandoned, with a fractured kneecap. He's returning to Italy for surgery, and may not be able to start the Tour. Petacchi has 19 stage wins in the last 3 Giros. Tomorrow's the Giro's last day in Belgium, with a rest day Wednesday and the team time trial from Piacenza to Cremona on Thursday. Today's Cyclysm Sundays episode is 2 hours devoted to the Giro d'Italia so far. It airs at 5 Eastern on OLN-TV. Here's everything you need to know to successfully follow the 2006 Giro via the web. OLN is repeating their approach from last year, providing a weekly recap show on their Cyclysm Sundays show and live coverage of Monday - Saturday stages through a partnership with Cycling.TV, at $19.99 for the entire Giro. If you already subscribe to Cycling.TV, that's another $19.99 to get the Giro. Mac users note: it works if you've installed Windows Media/Mac and/or Flip4Mac; I had better luck in Firefox and Safari than Camino. Look for live text coverage from VeloNews, cyclingnews.com, and Eurosport, with commentary most days at Daily Peloton. The official site, in English, Italian, French, Spanish, and German. 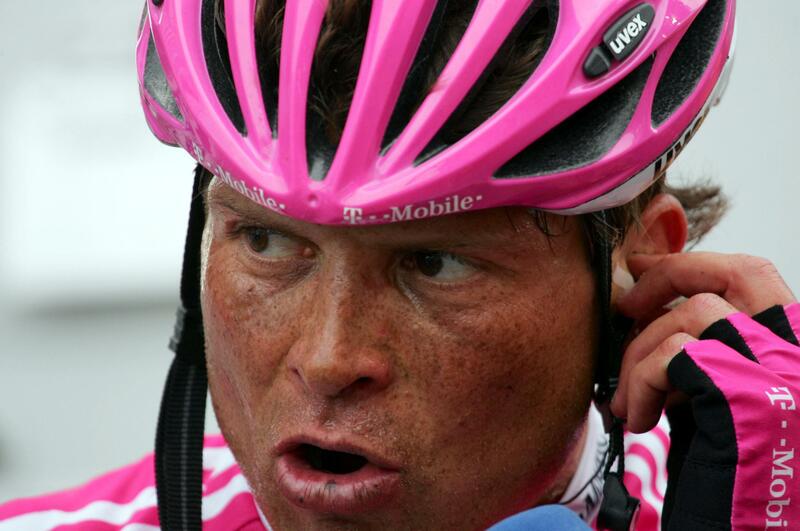 Jan Ullrich will race at the Giro d'Italia in May, in preparation for a run at the 2006 Tour de France overall title. Echoing Paris-Nice winner Floyd Landis, also tuning up in Italy, Ullrich said "I'm not looking at the general classification but I will be keen to test my legs on a few key stages." The 1997 winner has 6 podium finishes, and is the current favorite to win the 2006 Tour. He will be (as usual) the last major contender to kick off his season, April 4th at the Circuit de la Sarthe. At the Milram team presentation in Bremen Tuesday, Alessandro Petacchi said he intends to ride both the Giro d'Italia and the Tour de France in 2006. Petacchi, who has owned the Giro the last three years, winning 19 stages, had complained that the 2006 Giro route wasn't to his liking. Petacchi has been highly critical of a Giro route that, he says, only offers him five or six potential stage-winning opportunities ... Petacchi also revealed that his first objectives this season would be “Milan-San Remo, Ghent-Wevelgem and the Tour of Flanders”.